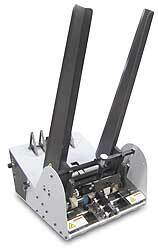 The Streamfeeder V-710IJ is for production mailing operations that demand maximum throughput from their ink jet printing, labeling, and tabbing bases. The lightweight Streamfeeder V-710IJ provides superior feeding to precisely separate and singulate many types and sizes of product. Job setups and changeovers are easily and quickly accomplished.